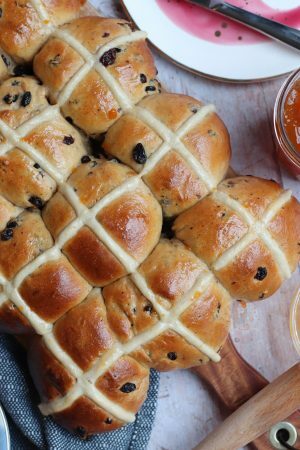 You can easily swap it for chopped up Cadburys Caramel Bars instead so you can make this recipe year round, or even use the Caramel Buttons. 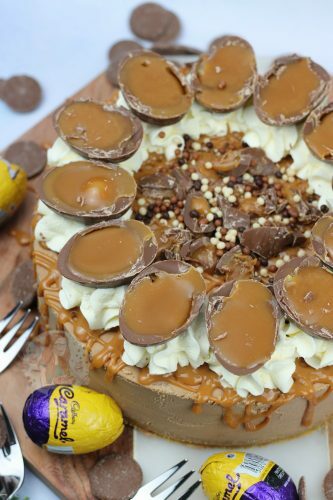 But to be honest, look how gooey and delicious the Caramel Eggs look. Slight sugar overload but YUMMYYYY. I went for a plain digestive biscuit base for this one, but you can easily make it chocolatey by adding in 25g of Cocoa Powder but I wanted plain. But then I did go for a Chocolate style cheesecake filling. Of course I did use Cadburys so it was a dream, but you can use any chocolate brand really! Supermarket own, Lindt, Galaxy etc! 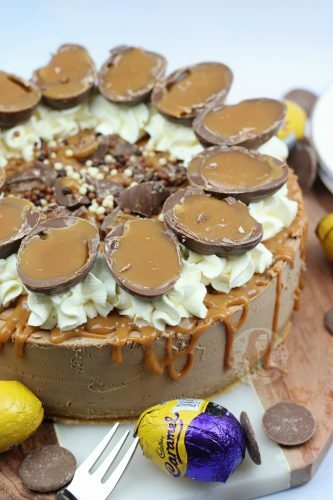 Some of my other cheesecakes that are based around something Caramel like either use a Caramel filling such as my Rolo one, or a combined flavour of Chocolate and Caramel but I wanted just Chocolate for this to get that real hit of Cadburys goodness. 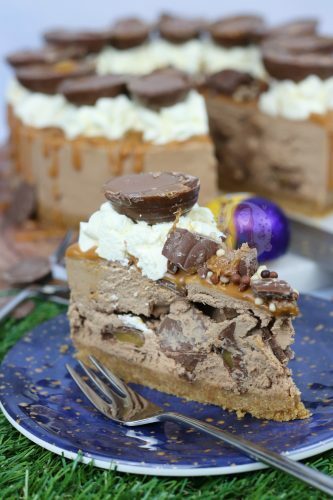 A Caramel Cheesecake is a dream on its own, but a Chocolate one with Cadbury’s Caramel chunks inside is INSANE. I do realise that it looks like a sugar overload for every slice, but realistically its not that much for one slice! I do add on a drizzle of Caramel for decoration (I used a smidge from a Carnation Caramel tin) but this is an optional thang. You can easily use Chocolate though as its easier! Often people ask how I drizzle my ‘drizzle’s on and I use simple small disposable piping bags and its that simple. The Tala Disposable Piping Bags (affiliate link) are PERFECT for all things drizzle and for small amounts. 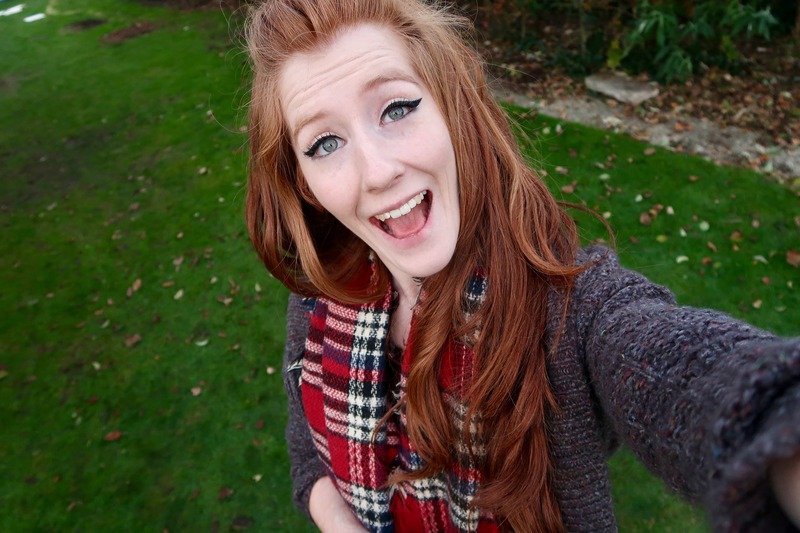 You just need to snip the end off and then its perfect. You can of course use a spoon, but I like my drizzles neat and easily done! 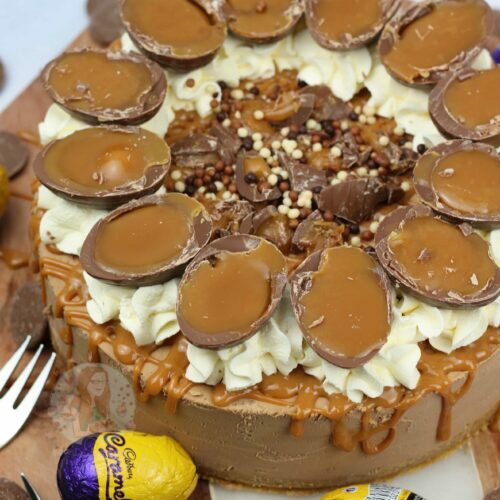 A No-Bake Cadbury's Caramel Cheesecake with a Buttery Biscuit Base, Chocolate Cheesecake filling with Cadburys Caramel Chunks, Whipped Cream, Caramel Drizzle, and Cadbury's Caramel Eggs! With an electric mixer (I used my KitchenAid Stand Mixer, or an Electric Hand Whisk) Mix the Cream Cheese, icing sugar, vanilla extract together until smooth. Pour in the melted chocolate and Whip again until combined. Mix with a spatula quickly to make sure its all combined well. Whilst slowly whisking, pour in the liquid double cream and continue to whip the mixture until very thick – It will hold it self when finished whipping. You can alternatively whip the cream separately and fold it through the cheesecake/chocolate mixture. 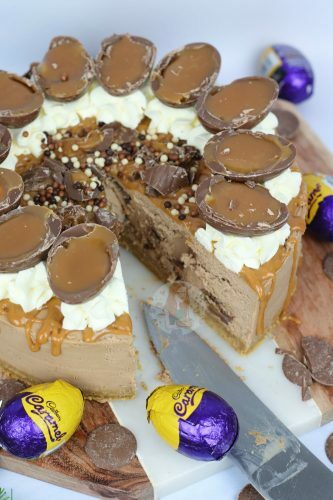 Chop up the Cadbury's Caramel Bars/Buttons/Eggs and fold through the cheesecake mix – pour onto the biscuit base and spread evenly. Leave to set in the fridge, covered, for 5-6 hours, or preferably over night! Whip together the double cream and icing sugar until thick but smooth. Drizzle over some caramel sauce. Using a Piping bag and a 2D Closed Star Piping Tip, pipe on the cream to decorate. 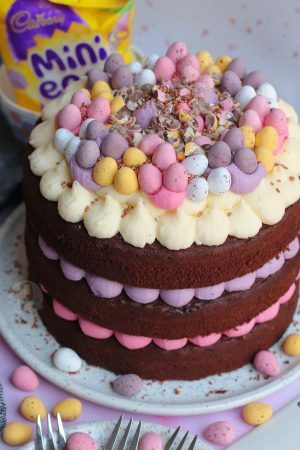 Place a half of a Cadbury's Caramel Egg on each swirl, and add some chopped bits into the middle along with some sprinkles! You can use Philadelphia Cream Cheese instead of Mascarpone - I just happened to use Mascarpone this time! I always set my cheesecakes in the fridge overnight otherwise they risk not being set enough! 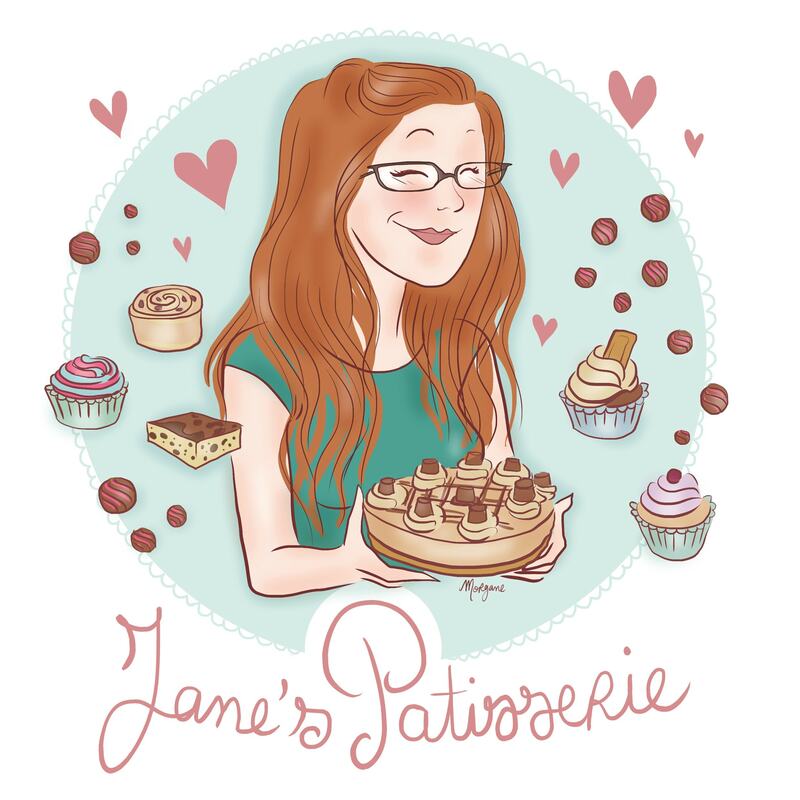 I would also 100% recommend using Full-Fat cream cheese/Mascarpone and cream if you’re going to be taking it out of a tin, and not setting it in cups for example as it needs the fat content to set! 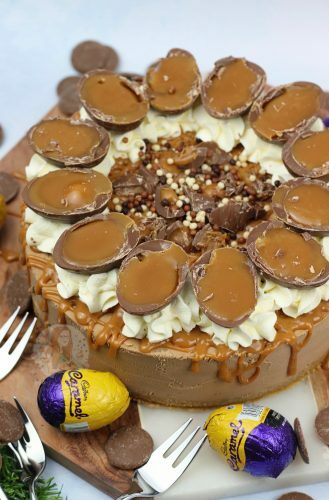 I use Cadbury's Caramel Eggs that I have refrigerated overnight to decorate as its near Easter time when I am posting this recipe, and refrigerated ones are much easier to chop. You can use the bar chopped up, or the buttons it you wished to decorate. Find my other Cheesecake & No-Bake Recipes on my Recipes Page! Older Next post: Chocolate Dippy Eggs! 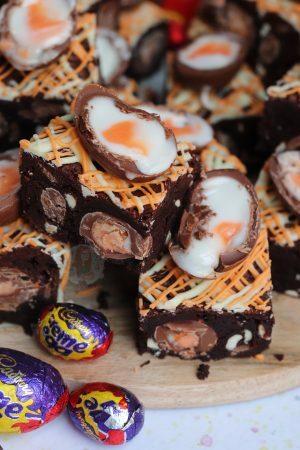 Newer Previous post: Creme Egg Cookie Bars! Can i use cadbury caramello chocolate bar in place of caramello eggs? If I leave the milk chocolate out of the cheese cake filling and make a vanilla filling, would the measurements of the other ingredients work? Or would i be best following the cream egg cheese cake filling and just replace creams eggs with caramel ones? Also would you recommend Mascarpone or Philadelphia for this? 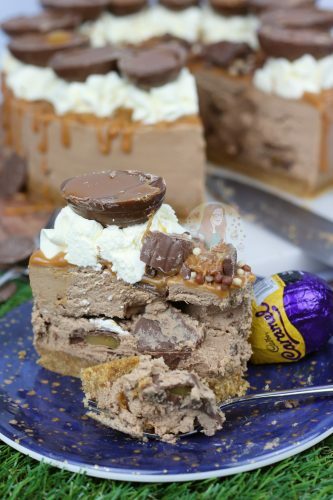 It would work as it is, but you could also do it like the cream egg one if you’d prefer! And honestly either work just as well as each other, I just prefer Mascarpone in general lately! Chill them first, and then use a large sharp knife. Cut along the join line!